Any drug charge in New Jersey needs to be taken seriously. A conviction could have an adverse impact on your future and leave you with a permanent criminal record. If you are accused of possession of a hypodermic needle or syringe, it is imperative that you do not delay in contacting an experienced attorney who can begin building your defense. The Tormey Law Firm is a drug defense team that handles countless drug cases throughout Essex County, including Millburn, Montclair, and South Orange. Our skilled attorneys offer aggressive representation in and out of the courtroom. We know how to negotiate deals with prosecutors in minor drug cases; we are also prepared to contest serious drug charges at trial. The bottom line is that we will do everything possible to win your case and ensure that your permanent record is not tarnished by a drug conviction. Whether you have been charged with possession of a hypodermic needle or discarding a hypodermic syringe, the Tormey Law Firm can help you. Call us today at 201-556-1750 to discuss your charges. N.J.S.A. 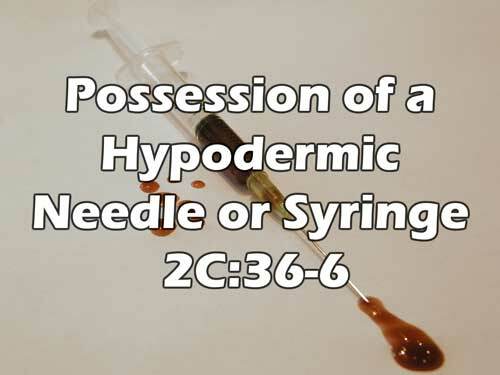 2C:36-6 prohibits a person from possessing a hypodermic syringe or needle for the use of a controlled dangerous substance (CDS). This statute is structured similarly to the drug paraphernalia statute because both laws deal with devices or instruments that are commonly used to ingest a CDS. 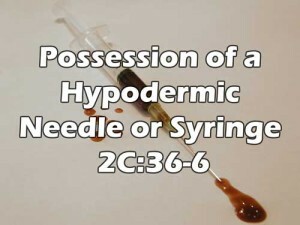 The exception to the hypodermic needle statute is that a person may possess and use a hypodermic needle or syringe so long as the instrument is obtained in accordance with a valid prescription that has been issued by a licensed physician, dentist, or veterinarian. However, even then, the needle or syringe must be used only for its authorized purpose. Additionally, the prescription is automatically invalid after one year has passed since its date of issuance. Additionally, one of the major collateral consequences of a conviction is that you will have a black mark on your permanent record. Worse yet, this won’t be just any kind of criminal conviction; it will be a drug conviction. Imagine having to explain a drug conviction to a future employer. The Vitale-Weinberg Bill, also known as S-958, went into effect in 2012. This law allows any person over the age of 18 to purchase up to 10 hypodermic needles or syringes from a licensed pharmacy without a prescription. However, it is still illegal to sell any needle or syringe obtained from the pharmacy. If you or a loved one has been charged with possession of a hypodermic needle, do not wait to speak with a lawyer. The Tormey Law Firm is committed to protecting your legal rights and ensuring that your permanent record remains clean. 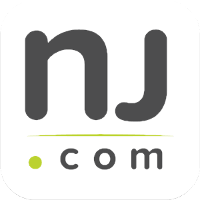 Call us today at 201-654-3464, or fill out the online contact form to schedule a free consultation at our Newark office.